Dale Chihuly’s Mendota Wall is a large sculptural installation of 1,284 pieces of blown glass. 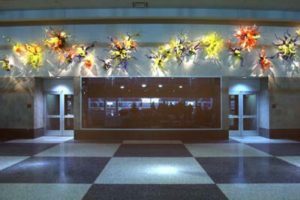 Scattered in clusters along a curved main entry wall, each piece of glass has an organic form and is rich with color in greens, reds, blues, and yellows. 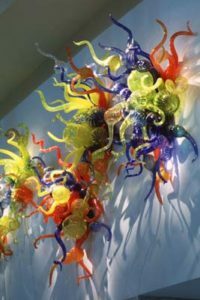 The installation is a part of Chihuly’s larger Anemone Wall series where collections of curved glass resemble abstracted tentacles of a sea anemone. 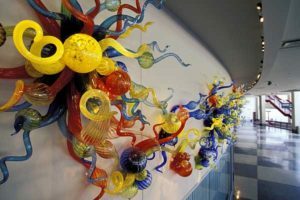 An installation from the Anemone Wall series was included in the 2002 Olympic Arts Festival in Salt Lake City and another remains on view at the University of Washington’s Meany Hall in Seattle. Originally from Tacoma, Washington, Dale Chihuly came to Madison in 1965 to study with renowned glass artist Harvey Littleton at the university. 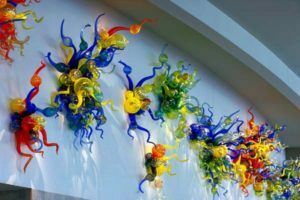 UW-Madison had the nation’s first collegiate program in glass and Littleton is credited with founding the “American Studio Glass Movement.” Chihuly is best known for large-scale glass installations that draw from his Pacific Northwest roots. The shape of his artwork often evokes fluid sea life or sprouting flora in vibrant color. Many of his installations are site specific and frequently located amongst nature. Chihuly donated a portion of the artwork to UW-Madison as a tribute to his alma mater. The remaining costs were supported by the Wisconsin Arts Board Percent for Art Program with other generous donors. Chihuly’s artwork can be found in more than 200 museum collections worldwide. In 2013, UW-Madison recognized him with an honorary Doctor of Fine Arts degree. Mendota Wall is installed in the Kohl Center’s main north lobby (601 W Dayton Street). Public access to the building is available Monday-Friday, 7:30am – 4:30pm via Gate B at the building’s northwest corner or during special events. Chihuly, Dale. Chihuly: Color, Glass, and Form. Tokyo and New York: Kodansha International, 1986. Chilhuly, Dale. Chihuly Garden and Glass. Seattle: Portland Press, 2012. Kuspit, Donald B. Chihuly. 2nd ed. New York: H.N. Abrams, 1998. Lynch, Kevin. “Glass Act.” The Capital Times, December 9, 1997. Ward, Gerald W.R. Chihuly: Through the Looking Glass. Boston: MFA Publications, 2011.